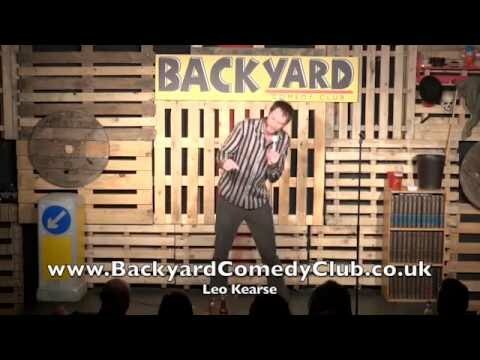 Scottish Comedian of the Year Leo Kearse is part of the new wave of raw, bold, American-inspired comedians taking the big UK clubs by storm – doing weekends for The Comedy Store, Just The Tonic, Bound and Gagged, Top Secret, Backyard Club – and abroad, with 2018 taking in Adelaide, Melbourne, Ibiza, Turkey, Holland, Cyprus, Germany, Belgium, Sweden, Belarus and Denmark. He’s written for BBC comedy including Sam Delaney’s News Thing, Question Time, Breaking The News and a Live At The Apollo appearance. Leo also acts, playing Mick Fleetwood in a forthcoming ITV drama about Fleetwood Mac. He’s been on ITV Dinner Date (and won), Al Jazeera and BBC2’s Funny Business. His comedy shorts include a Star Wars spoof video that’s had half a million views, and a “Stand up on the tube” stunt that got him in the Mail and Metro and was shared on Ladbible. He has appeared in adverts for Dulcolax and Whiskas. Leo was a backing dancer for a David Icke conspiracy theory lecture at Wembley Arena. As well as straight standup, he also performs at festivals and cabaret nights as the improvising Pun-Man (Leo is the 2015 UK Pun Champion). Pun-Man appeared on Britain’s Got Talent. Leo is the co-creator of sellout show Hate ‘n’ Live, which has improvising comedians hating on audience suggestions – Whose Line Is It Anyway? meets Room 101.